Goodreads says, "Sixteen-year-old Kyra, a highly-skilled potions master, is the only one who knows her kingdom is on the verge of destruction—which means she’s the only one who can save it. Faced with no other choice, Kyra decides to do what she does best: poison the kingdom’s future ruler, who also happens to be her former best friend. But, for the first time ever, her poisoned dart . . . misses. Now a fugitive instead of a hero, Kyra is caught in a game of hide-and-seek with the king’s army and her potioner ex-boyfriend, Hal. At least she’s not alone. She’s armed with her vital potions, a too-cute pig, and Fred, the charming adventurer she can’t stop thinking about. Kyra is determined to get herself a second chance (at murder), but will she be able to find and defeat the princess before Hal and the army find her? Kyra is not your typical murderer, and she’s certainly no damsel-in-distress—she’s the lovable and quick-witted hero of this romantic novel that has all the right ingredients to make teen girls swoon." Kyra is a Master Potioner and is best friends with Princess Ariana. But now she is running from the army who is tracking her because she tried to kill the princess. Yes, Kyra tried to kill her best friend, because she has been having visions which show that massive destruction will come to the kingdom if the princess lives. Kyra feels she had no choice but to take matters into her own hands. However, her poisonous dart misses and she never misses, which is why she is on the run. While on the run, Kyra takes part in many adventures. For starters, she seeks help from an organized crime lord, who in turn gives her a tracking pig. While on the road, she also encounters a fellow traveler, Fred, witches, and even goblins. Readers are wondering if Kyra will be able to save the kingdom after all. 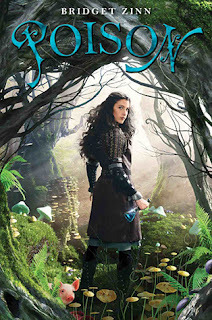 Poison, a debut by Bridget Zinn, reminds me of the old-school fairy tales and fantasies I read when I was a child. There's adventure, a sweet romance, action, a fiesty heroine, scary creatures, and did I mention there's an adorable pig? Kyra is the type of heroine I love. She's strong, she's smart, and she's independent. She is able to make potions that will confuse her enemies, put them to sleep, or even kill them. She is so good at it that she works for the royal family, which is why she has become close with the princess. Normally Kyra wouldn't betray a friend, but her prophetic visions show the kingdom falling apart if the princess takes over. Kyra knows what she has to do, even if it means killing her best friend. Kyra meets so many fun characters on the run. I loved her interactions with love interest, Fred. They were too cute, especially when his dog decides to befriend her pig, Rosie. Aww! Rosie is such an adorable addition to Posion; it had me getting all nostalgic for Hen Wen from The Chronicles of Prydain. All in all, Kyra is more than just a murderer in Poison as there is more than meets the eye with her. The one issue I had with Posion was the world-building. I wanted to learn more about the kingdom and the surrounding lands as well as the many creatures that go bump in the night, such as the goblins or witches that haunt the woods. Once I got past that, I was able to get lost on Kyra's quest and even a little surprised by some of Kyra's secrets. Posion is definitely going to go on my classroom bookshelf. I think my seventh grade students would especially like this adventure as it's perfect for middle grades. I immediately looked up when book two was going to be published, but was deeply saddened to find out that Bridget Zinn passed away from cancer last year. I wish I had something eloquent to say, but it's just so heartbreaking. Instead I leave you with Bridget Zinn's final tweet: "Sunshine and a brand new book. Perfect." I couldn't agree more. I'm definitely interested in Poison. I'm not 100% sure it's for me, but I definitely want to give it a try. I think I will be okay with less worldbuilding. If you do pick it up, I hope you enjoy it. It was definitely a fun read. Thanks for visiting, Quinn. You can't go wrong with an adorable pig! That's disappointing that the world-building was lacking a bit, but this still sounds like a fun book to check out of the library. I know, right?! Rosie, the pig, was one of my favorite characters. :) It was definitely fun. If you do read it, I can't wait to hear your thoughts. Thanks for visiting, Lea! It sounds like a really cute middle grade read and that is just too bad that the story won't continue to go on after this. It is definitely perfect for middle grade. I think my students will love it. It's so sad about Bridget Zinn. :( Thanks for visiting, Alexa. This sounds great! It's good to know it's suitable for younger YA readers. Yes, I definitely plan on sharing it with 7th grade students. I think they would love it! Thanks for visiting, Molly. This was one of the books voted as one of the most wanted debuts of the year as voted by readers on my blog and I was also very sorry to hear of Bridget's passing. So sad. I know! It's so sad. :( Thanks for visiting, Leanna! I love fantasy so this book was immediately on my radar. I was even more curious after all the buzz for it lately. I'm happy to hear that Kyra is a great female lead and I look forward to picking this up.